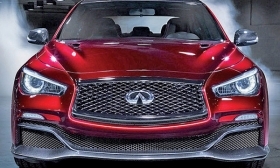 The proposed Q50 Eau Rouge would give Infiniti a $100,000-plus image car. Infiniti dealers and consumers will wait until 2016 at the earliest to see a number of critical new products that have been promised. The pipeline includes a trio of as-yet-unidentified new compact vehicles, built in Mexico in cooperation with Mercedes-Benz. There will be at least one new car above the Q70 in size and a small-volume performance car based on the Q50. The brand got a shock this month with the sudden departure of Johan de Nysschen as Infiniti's worldwide president. De Nysschen's move to Cadillac after two years at Infiniti's helm has sparked concern that the aggressive long-range rebuilding program he championed might be in jeopardy. Under de Nysschen, Infiniti has been approved to increase its model offerings 60 percent and double the number of available powertrains. But Andy Palmer, Infiniti's chief corporate architect as Nissan Motor Corp. executive vice president, indicated that the plans would not change in de Nysschen's absence. Click here to download a PDF version of our timeline. These are Infiniti's current plans. Q80 or Q90: Infiniti will produce a performance-engine-powered four-door coupe in 2017 or 2018. It will be positioned above the Q70, although Infiniti has not disclosed the name. The Porsche Panamera fighter could share Mercedes-Benz's modular rear-wheel-drive architecture and carry a turbocharged V-6 capable of 600 hp to 700 hp, according to comments made by de Nysschen this year. Q30, QX30: The compact Q30 hatch will be imported from Sunderland, England, in early 2016, and its sibling QX30 crossover version half a year later. The models are designed on the Mercedes-Benz MFA vehicle architecture, which also yields the Mercedes A class and GLA. Intended to compete against the Audi A3/Q3 segment, the Infiniti duo will use a 2.0-liter Mercedes engine. Europe will be the primary market for the entry-level premium cars initially, and North American distribution will come second. Mexico compacts: Infiniti has revealed little about the models it will obtain from the $1.36 billion Mercedes-Benz joint-venture auto plant in Aguascalientes, Mexico, that was announced last month, except that they will be compacts in three versions for both Infiniti and Mercedes. Infiniti's half of the planned 300,000-vehicle-a-year capacity will begin reaching retailers in 2017. One Infiniti source says the models will be a more U.S.-focused second iteration of the upcoming British-built Q30 and QX30 platform, which would free up Sunderland's capacity for Europe. Q50 Eau Rouge: Using the Q50 as its base architecture, the proposed carbon fiber-trimmed Eau Rouge would be to Infiniti what the low-volume GT-R racer is to the mass-market Nissan brand. If Infiniti goes ahead with the $100,000-plus image car in 2016 or 2017, it would even use the GT-R's hand-built twin-turbo 3.8-liter, 560-hp V-6 engine. Discussing the plan publicly a week before he left the company, de Nysschen said Infiniti expects to sell just 500 Eau Rouges a year. LE: Infiniti's postponed electric sedan, originally scheduled to launch in 2014, is back in the product plan. Now being eyed for 2017-18, the EV will share an architectural platform with the Nissan Leaf but have a unique body design and luxury interior. It also will come with a next-generation battery range beyond the current standard of approximately 90 miles. Q70: The brand's flagship sedan, formerly marketed as the M45, will receive a significant freshening when it appears as a 2015 model in September. The update will include a new grille, revised front and rear fascias, and LED headlights, taillights, fog lights and turn signals. The sedan also will come in a long-wheelbase version in 2015, marketed as the Q70L. It will feature 5.9 inches of additional rear seat room, available with 3.7-liter or 5.6-liter engines. QX80: The 2015 full-sized SUV will be freshened when it appears in October, with restyled front fascia and grille, LED headlights and fog lights. It also will have interior trim changes and the addition of Predictive Forward Collision Warning and other technology. Q50: Infiniti's new volume leader, the Q50 sedan, is mostly unchanged from 2014.
will be sold as the Q40. Q60 coupe and convertible: The models, formerly sold as the G37 coupe and convertible, will carry over from 2014. Both the Q60 and Q40 nameplates are temporary offerings until new Infiniti models replace them. QX60: The 2015 model receives a software enhancement to its continuously variable transmission when it arrives in October. A major freshening comes in late 2015. QX70: A redesign is likely for late 2016. The crossover's 5.0 all-wheel-drive version was discontinued for 2015. QX50: China may influence the fate of Infiniti's low-selling small crossover. A stretched-wheelbase QX50 will start production there in the coming weeks. Chinese demand could keep the model alive globally, despite the arrival in 2016-18 of more modern small crossovers with development costs shared by Mercedes-Benz.